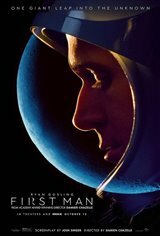 The story of astronaut Neil Armstrong (Ryan Gosling), and the legendary space mission that led him to become the first man to walk on the moon on July 20, 1969. Years before Apollo 11 first touched ground on the moon, superior engineer Neil Armstrong catches the attention of NASA, which is looking for pilots with excellent backgrounds in engineering. He’s recruited as an astronaut and moves his wife Jan (Claire Foy) and their family to Houston, where he embarks on his new career for his country. The Cold War ignites a rivalry between the United States and Soviet Union, and a race ensues to see which country will be the first to send a man to the moon. America set its sights on achieving the lunar landing before the end of the decade and Armstrong is tasked with commanding the mission. However, this trip is not without its risks, and as the launch date looms closer, Armstrong must fight to ignore the catastrophic danger and growing doubts that surround this impossible goal. Based on the 2005 book First Man: The Life of Neil A. Armstrong by James R. Hansen.